It seems like someone is always trying to reinvent the wheel. While keeping things simple is generally my mantra (I’m a, “don’t fix it if ain’t broken,” kind of guy), there are occasions when even the simplest of items can benefit from just a little tweak. Like a magnetized screwdriver. Or Windows 98. But does a dog bed really need to be anything more complicated than a cushion on the floor? The answer, as you might have guessed, isn’t that simple! 3 What Is An Elevated Cooling Bed and Why Should I Buy One? 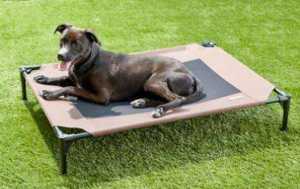 4 How Do Elevated Cooling Dog Beds Work? 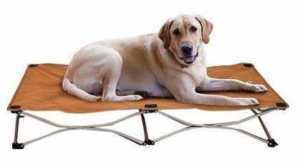 Here’s the wonderful part of the article where I make life even easier for you by recommending six of the best elevated dog beds on the market. You’re unlikely to go wrong with any of these choices. Note on dimensions: Keep in mind that the dimensions given are those of the frame; the actual sleeping surface will be a bit smaller. Why we love it: Fold-and-go convenience. No assembly required. 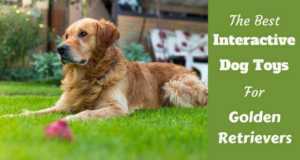 Carlson Pet is a reputable manufacturer with a huge array of quality pet products available. Those who have purchased this bed rave about how sturdy and comfy it is, and how it’s so easy to set up and put away. All this, and it weighs just 6 pounds, so moving and storage will be a breeze. Why we love it: This bed comes in 4 sizes, though the 2 smaller versions might not be enough for a medium to large dog like a Golden. With a durable steel frame and high quality material, the second-largest model will support up to 150 pounds of fluffy love! Assembly can be accomplished with no tools required, and yet it’s sturdy enough to hold 2 dogs – perfect for those of us with more than one best friend! The mesh fabric is reinforced around the perimeter for extra strength, but is highly breathable in the middle where your dog lies. Why we love it: It’s perfect for the outdoors! The curved back will hug your pooch, and the Smart Air-Flow mesh will him them cool and dry. Assembly is tool-free — the parts just snap together easily. Making storage and transport stress-free. The frame is powder-coated steel, and the nylon mesh fabric is washable. Why we love it: It’s got a bolster so it’s super cozy! The mesh center ensures great circulation, and it comes in a large enough size that’s suitable for a Retriever. It has rubber feet that keeps the bed from skidding. The frame is easy to assemble and disassemble – no special skills or tools needed. Cleanup usually just requires a few swipes with a damp cloth, but the fabric cover can be removed and machine washed if needed. Why we love it: Frisco offers this bed in 3 sizes, and 4 colors with the Large size being the most suitable choice. Not just pretty to look at, the PVC coated fabric is tightly woven yet breathable, which means it’s dirt-resistant, and it’ll support your dog and keep them comfortably cool. The steel frame has a powder finish and is good and sturdy, and very easy to put together. Why we love it: The frames on all these beds are very similar, but it’s the fabric that sets this one apart; Coolaroo knows the fabric business – they make high-quality hammocks, sunshades, gazebos, and more. 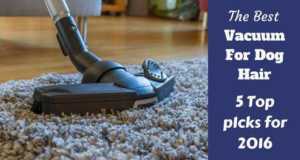 The material is flea, mite, mold, and mildew resistant, lead-free, and is easily cleaned. The bed has a 5-year limited warranty, too. Three sizes are available, but the medium is your best bet. And unlike most of the competitors, you can actually choose from 4 colors: green (shown), grey, terracotta, and nutmeg. While not machine washable, feel free to vacuum or hose off the fabric. And if it wears out (or you want a variety of colors) replacement fabric can be purchased separately. It is very difficult to find anything negative to say about this bed. Walk down the dog bed aisle at your local pet supply superstore, or do some searching online and you’ll discover an array of choices you probably weren’t expecting. As dogs come in all shapes and sizes, so do dog beds. There are round beds, oval beds, rectangular beds, beds with pillows, beds with bolsters, beds with feathers, and beds with foam. And there are many styles to choose from; cave beds, orthopedic beds, heated beds, donut beds, and yes, just a plain old cushion on the floor! 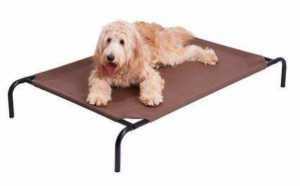 But a style of bed you perhaps haven’t considered (or maybe you have and you want to know a little more about them) is the elevated cooling dog bed. Read on to find out why it might be time to take your dog’s bed to the next level. What Is An Elevated Cooling Bed and Why Should I Buy One? Picture a cot. Got it in your mind? Ok, well, that’s pretty much what an elevated dog bed looks like! Generally speaking, they have a tubular frame with four feet and some manner of fabric stretched across the frame. The idea behind this style of bed is simple: A dog is more comfortable off the floor than on it. By raising your Golden a few inches up off the floor, you relieve the pressure points created by lying on a hard surface. This is good for the joints, which is key for larger dogs like Golden Retrievers. My dogs love to sit at the edge of the stairs and dangle their paws over the edge. An elevated bed allows for this and many other positions that are not achievable at ground level. The other key benefit of an elevated cooling bed is, clearly, the cooling aspect. Cooling beds employ some sort of technology to keep your Golden from overheating. This is a great thing for a dog that’s perpetually wearing a big fur coat! 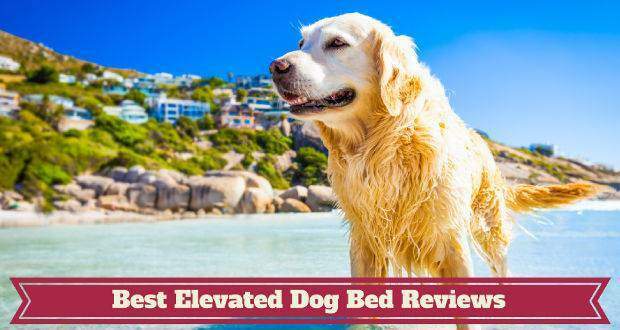 Whether you live in a hot climate, or if the dog days of summer are kicking in, an elevated cooling bed is just the thing to help your Golden Retriever keep his cool. 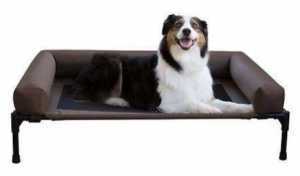 One of the advantages of an elevated cooling dog bed versus a typical dog bed is its versatility. Since it sits on four slim legs, rather than right on the ground, it can be used outdoors without getting dirty. Just wipe off the feet and it’s ready to come back inside. 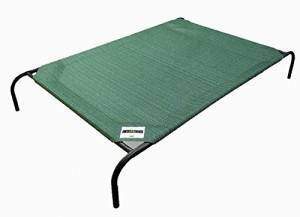 If your yard is lacking in shade or grass, an elevated cooling dog bed is a nice alternative to lying on the deck or patio. And if you like to go camping with your Golden, many models are easily disassembled for easy transport. Cot-style beds are very low profile as compared to traditional dog beds, so you may also find they are less visually intrusive in your home. 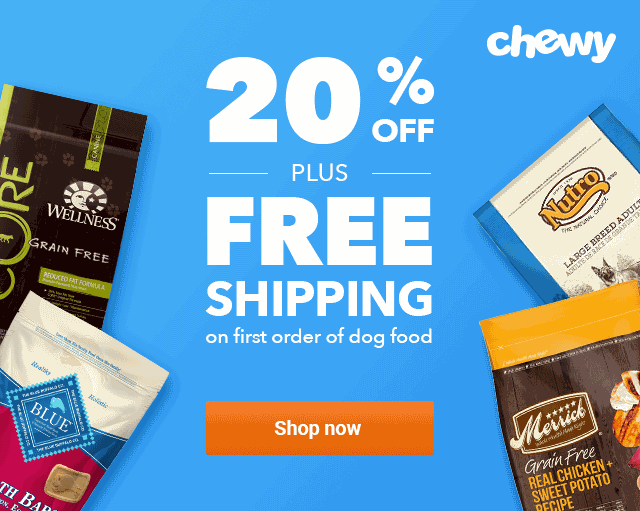 How Do Elevated Cooling Dog Beds Work? The simplest cooling beds cool dogs down by allowing airflow between the floor (or ground) and the dog. By using mesh or some other permeable fabric, air can move all around the dog, helping to keep the dog cooler than being right on the floor. Helpful Tip: If your Golden covets the floor vents during a/c season, try placing the bed over the top of one. If you like a more technologically advanced approach than just airflow, you might like to try an elevated bed that incorporates a self-cooling gel mat. These mats utilize the same kind of gel often found in self-cooling pillows and mattresses for people. In theory, (and without getting too heavily into thermodynamics and other things I did poorly at in school) the gel wicks away excess heat that radiates from the body. They seem to be perpetually cooler than whatever the ambient temperature is. The jury is still out on the efficacy of this sort of product; many swear by them, but some tests have shown them to be less effective than advertised. What is generally agreed upon, gel-based pads, pillows and mattresses do provide short-term cooling benefits, but they don’t seem to be able to keep the sleeper cool for an entire night. My feeling on gel mats is they may be a pleasant spot for a nap on a warm day, but won’t keep your Golden any cooler when it goes down for the night than most normal beds. Having said that, if your dog isn’t the type to stay in one place all night, that won’t matter so much. Of course there are a lot of similar beds on the market, which makes it tough to choose a good one for your Golden. 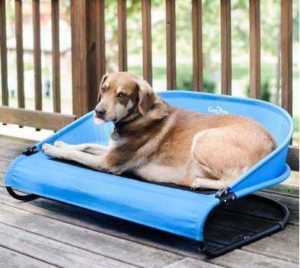 Price isn’t really much to go by with this sort of bed; there really isn’t a lot to an elevated cooling dog bed, which keeps costs low for nearly every model. The support frame of the bed should be made of aluminum or steel in order to be “chew proof.” As you might imagine, anything made of plastic may not survive a chew happy pup. The weave of the mesh should be fairly tight to prevent claws from hooking, either by accident or on purpose. Rubber feet will go a long way towards preventing floor damage, and will also keep the bed in place as your dog gets in and out. The material should be tight enough to support the dog evenly, but not so tight that there’s no give at all. Imagine lying down on a drum and you’ve got a fair idea of what a cot that’s too tight would feel (and sound!) like. From a safety standpoint, avoid beds with large gaps at the corners. Some beds have their fabric cut in such a way that there are holes at each corner of the bed. An unlucky dog might put their foot down into the hole and risk injury. Naturally, this list is just a starting point for your research. 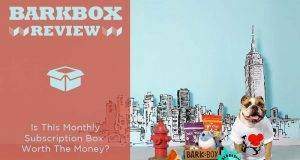 Reading reviews from those who have purchased these and other similar products will help, as will taking a field trip to a nearby pet store. Check out manufacturers websites, too, for more information, and to get a feel for how easy it will be to obtain customer service, should you need it. Happy shopping to you, and happy lounging to your dog! And seriously, who’s happier than a comfy Golden? "Jim Wright is a freelancer who has previously written about fish, snakes, lizards, and hedgehogs. He is delighted to now shift his focus and share his experiences raising his perpetual puppy, Stitch the Black Lab (and a cantankerous old German Shepherd named Lucy). Jim lives east of Toronto, where he writes and designs marketing material for small businesses. He can be reached at [email protected]com."